There are approximately 40,000 kinds of spiders found throughout the world. Most of the common house spiders are harmless, but the widow spiders and brown recluse spiders are two venomous spiders in the US. The house spider randomly chooses the location to make their web. If location does not produce a source of food, another site is selected, and the spider will build a new web. 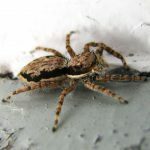 Some spiders like moisture and are found in damp areas, crawl spaces, and basements. Others like dry, warm areas such as subfloor air vents, upper corners of rooms and attics. They hide in dark areas, and spiders feed on insects, other spiders and any other prey they are able to subdue. House spiders have an easier time going after prey in outdoor structures, but they can find their way into your home. It doesn’t take many spiders to start an indoor population, as A typical spider’s egg sac can hatch out hundreds of baby spiders. Normally, spiders can be found in kitchens and bathrooms because their prey are found in these sites, attracted by food and water. Spiders are also common in basements, garages, closets, windows, and doors. Spiders will gather near indoor or outdoor light sources that attract insects.